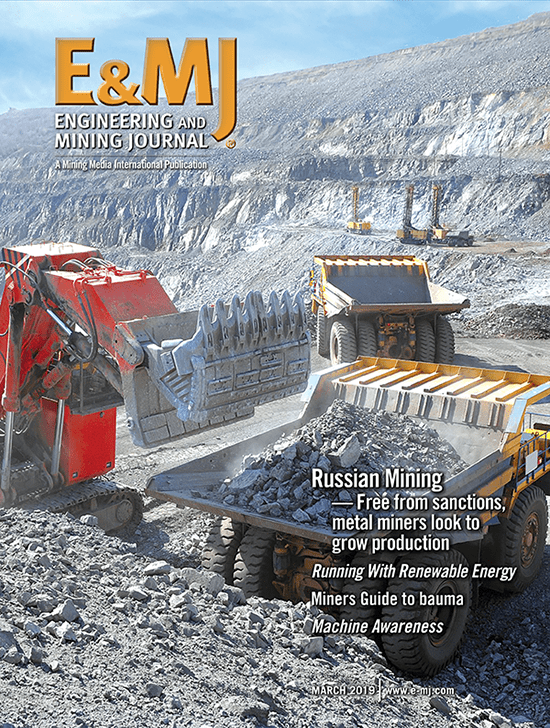 According to industry experts, energy efficiency is now a key to success at modern mines. The most potential for energy and cost savings can be realized in the comminution process, where ore is ground and crushed into smaller particles. With the HRC 3000, Metso said it has provided an energy-efficient solution with a range of features, aimed at getting more value from every ton of ore.
Morenci’s HRC 3000 HPGR has been in operation for more than 8,400 hours and during that time has crushed more than 34 million tons of copper ore. 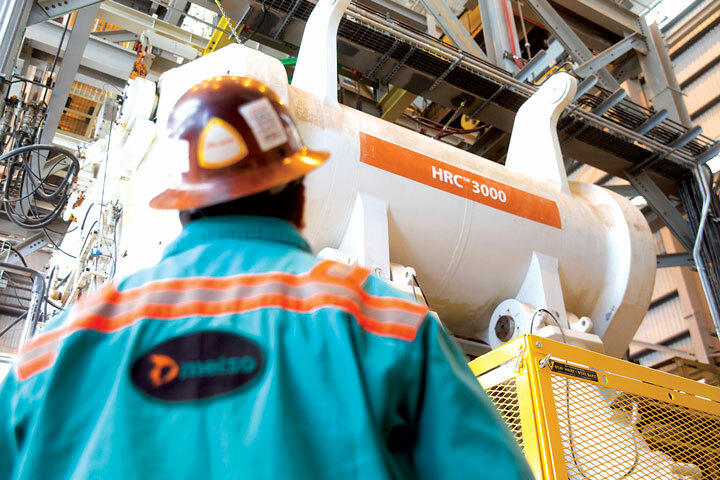 The HRC 3000 was the result of collaboration between Metso and Freeport-McMoRan Inc. 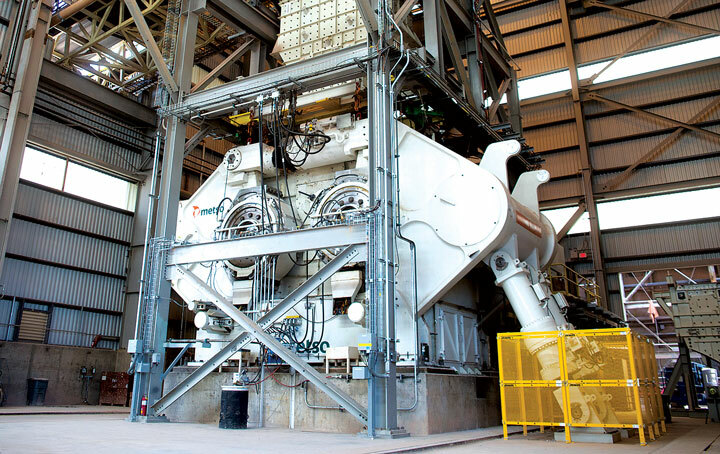 The goal was to develop a highly efficient, high-pressure grinding rolls (HPGR) crushing circuit for the newly constructed Metcalf concentrator at Freeport-McMoRan’s copper mine in Morenci, Arizona. 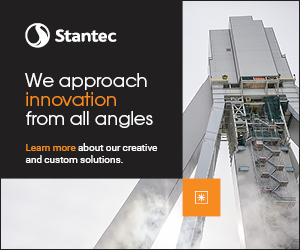 In approximately four years, the team went from a design concept to the largest fully operating HPGR in the world. The HRC 3000 began operations at the Morenci copper mine in May 2014. According to the company, it’s the largest of its kind in the world, allowing the mill to employ fewer equipment lines. Metso reported recently that the unit had operated for more than 8,400 hours and has crushed more than 34 million tons (t) of porphyry copper ore. Metso said this solution has provided the Morenci mine with several benefits, including an estimated 13.5% increase in energy efficiency over traditional HPGRs based on pilot-scale testing. Metso noted that the HRC 3000 is the first full-scale HPGR to incorporate features such as a flanged tire design and the patented Arch frame. Depending on the application, the total capacity of this HPGR can exceed more than 5,400 t/h of ore.
“In addition to boosting the equipment’s energy efficiency, our main goal was to innovate and to push the existing boundaries in order to ensure a valuable solution to our customer. This HPGR is not only a larger scale version of what was currently available to the market, but also applies technological solutions to overcome some inherent concerns typically associated with traditional HPGRs, including skewing and edge effect,” said Victoria Herman, product manager, HRC HPGR. Metso says the patented Arch frame used on its most recent HPGR models creates an even gap setting across the width of the tires, limiting skewing problems. The frame design also prevents damage to roller bearings caused by misalignment problems inherent in older HPGR designs.